Business owners depend on their parking lot being safe, durable, and appealing, and that is why savvy business owners contact Intercounty Paving for all their parking lot paving needs. We have over five decades of experience and knowledge in the asphalt industry. We are a family-owned and operated business that started out three generations ago. We provides a wide range of commercial asphalt services to meet the needs of our customers. 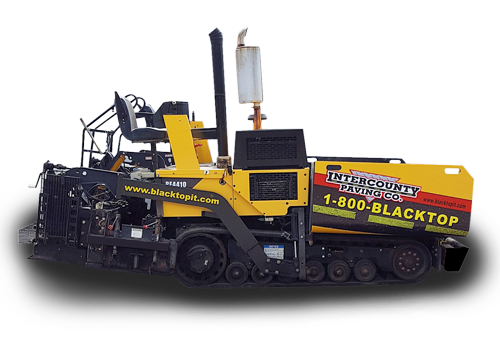 Intercounty Paving provides commercial parking lot maintenance services, so commercial owners can rest assure that their lot will be maintained by a professional asphalt company with qualified team members. One of our maintenance services include parking lot line striping, which is done with the latest equipment and technology. We know the measurements needed by the state, so our parking lot line striping will be done to precise specs. We can also repair your asphalt parking lot. Our sealcoating service will have a parking lot looking nearly new and provide strength and durability. If your parking lot has standing water continuously, then it may require drainage services done. Our technicians can evaluate your parking lot and determine if there are drainage issues. If there are drainage issues with a parking lot, then the standing water can seep into the base of the asphalt and cause extensive and costly repairs. We can stop this type of damages by repairing the problem correctly which will lead to a longer lasting higher quality surface. Our experienced team specializes in all asphalt parking lots. We provide an asphalt service to meet all the needs of our commercial customers. 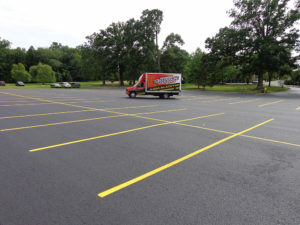 We can transform your parking lot with our asphalt services. We have over fifty years of experience, so your parking lot will be in professional hands. We use the latest equipment and only the best products, so our customers receive the highest level of asphalt services available. Contact us today and schedule a no-obligation consultation and our professional technicians will inspect and evaluate your asphalt, then provide you with options to meet your needs.